A man has appeared in court charged with the attempted murder of an 19-year-old in an alleged terror attack. 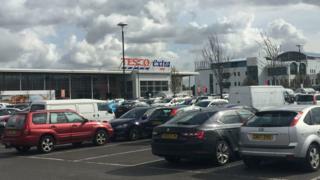 The teenager was stabbed on 16 March at a Tesco car park in Stanwell, Surrey. Vincent Fuller, 50, of Viola Avenue, Stanwell, who appeared at Westminster Magistrates' Court, is also charged with possessing a knife. He is also accused of attacking one of his neighbours earlier the same evening, and attacking cars with a baseball bat. Mr Fuller is charged with causing racially aggravated fear or provocation of violence over an alleged incident with his neighbour. He was remanded in custody and is due to appear at the Old Bailey on Friday. Detectives from Counter Terrorism Policing South East have said they were treating the attack against the teenager "as a terrorism case".